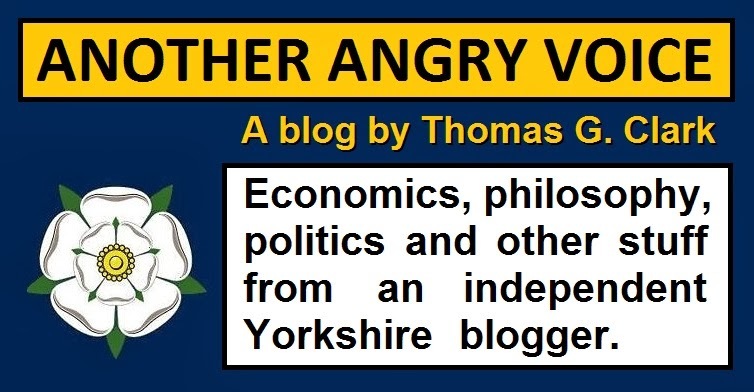 Why did the Tories align themselves with all the extreme-right nasties in the European Parliament? 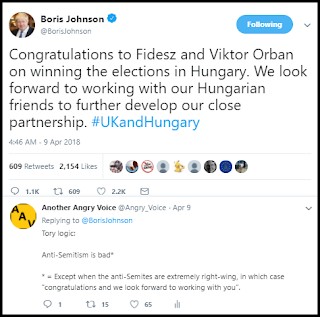 Days after the Tories aligned themselves with all the extreme-right nasties in the European Parliament to vote against censure of Viktor Orbán's anti-Semitic, judiciary-rigging, free press-attacking, human rights-demolishing government in Hungary, Theresa May and the Tories are still refusing to provide a convincing explanation for their actions. Fidesz - Orbán's ruling party in Hungary. PiS - The extreme-right government in Poland that is launching similar attacks on the judiciary and the free press to Orbán. Front National - The French extreme-right led by Marine Le Pen. FPÖ - The Austrian extreme-right party founded by the Nazi Anton Reinthaller. AfD - The German extreme-right anti-immigrant party. True Finns - An anti-immigrant nationalist party in Finland. Sweden Democrats - The Swedish extreme-right party with fascist and white supremacist origins. Lega Nord - The Italian extreme-right who are in coalition government with the populist anti-vaxxer Five Star movement. PVV - Geert Wilders' extreme right party in the Netherlands. Fortunately the Tories decision to back Orbán's fanatically right-wing government failed as the motion of censure was passed by 448 - 197, just passing the 2/3 majority needed. The Tory party were the only ruling conservative party in Europe to back Orbán, with the rest of the European conservatives joining the socialists, liberals and greens to condemn his undermining of the independence of the judiciary, his attacks on free speech and the freedom of the press, his vendetta against Hungarian civic society, his anti-Semitic smear campaigns, his anti-Muslim bigotry, and his discriminatory ethno-nationalist policies. When the scandal initially broke Theresa May tried to wash her hands of it by claiming that she had no knowledge of how her own MEPs had voted! This excuse is an extraordinary admission that Theresa May imagines that using her own incompetence and poor leadership as an excuse is an adequate reason for supposedly not knowing what her own MEPs are up to! The next excuse the Tories tried was that the vote was just a technical matter rather than an endorsement of Orbán's extreme-right government, with Downing Street instructing all the Tory MEPs who sided with the extreme-right nasties to back Orbán's government to issue a tweet claiming that their vote to back Orbán's government wasn't an endorsement of Orbán's government! 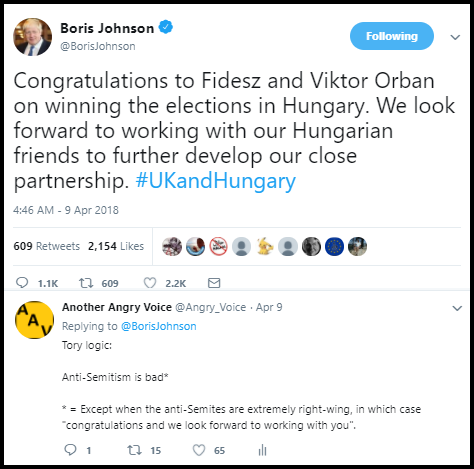 This narrative is ridiculous enough in its own right, but it's truly absurd when it's viewed in the context of the Tory Foreign Secretary's gushing praise for Orbán and his extreme-right party earlier this year after they used a massive anti-Semitic poster campaign to win the Hungarian election. There's a lot of speculation going around that the Tories deliberately aligned themselves with the European extreme-right in this way as a cynical Brexit manoeuvre to undermine the EU position in the negotiations by eliciting support from the mainly Euro-sceptic extreme-right. If that's the case then it certainly puts their Brexiteering into perspective. They're so keen to launch a hard-right economy-tanking, environment-wrecking, workers' rights-abolishing, food standards-trashing Brexit that they'll gladly align themselves with the European extreme-right fringe to achieve it. 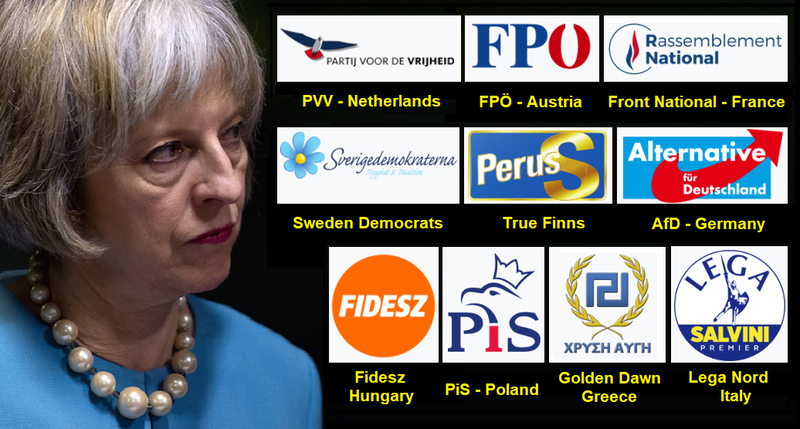 But don't expect Theresa May to be pressed very hard on this outrageous scandal because backing her into a corner over her party's demonstrable support for one of the most dangerous anti-Semitic bigots in Europe runs entirely counter to the prevailing mainstream media objective of steadfastly defending the neoliberal orthodoxy by vilifying Jeremy Corbyn and the Labour Party's return to democratic socialism under his leadership.